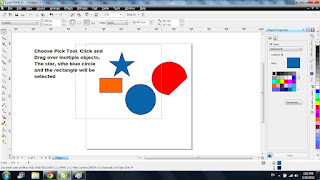 Pick Tool is the most important tool in CorelDraw. Everytime you want to select an object you'll use this instrument. Shortcut key for the Pick Tool: Spacebar (if you are typing a text, the shortcut for the Pick Tool is Ctrl + Spacebar). In CorelDraw, you must select an object before you can apply any change. You can select one object, a group of objects, or all the objects in the page. 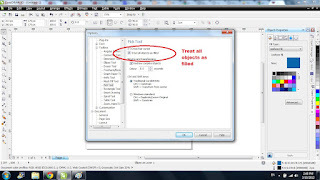 Click anywhere on a filled object to select. 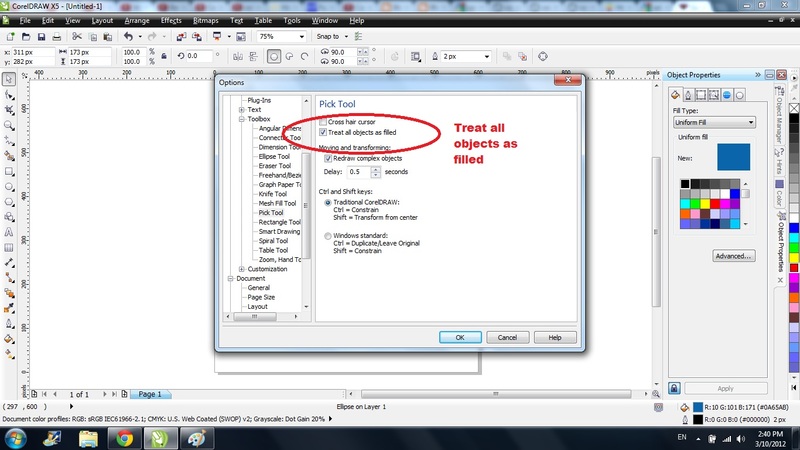 If an object has no fill, click on the outline to select. A series of handles appears around your object to signify it is selected. Click anywhere outside the object to deselect it. If you click twice on an object, the rotation tool will be activated. An object with no fill must be selected by clicking on the outline. To change this so that you can click anywhere within the object, choose Layout, Page Layout, Workspace, Toolbox, Pick Tool. Choose Treat All Objects as Filled from the Pick Tool Options. Choose Pick Tool. 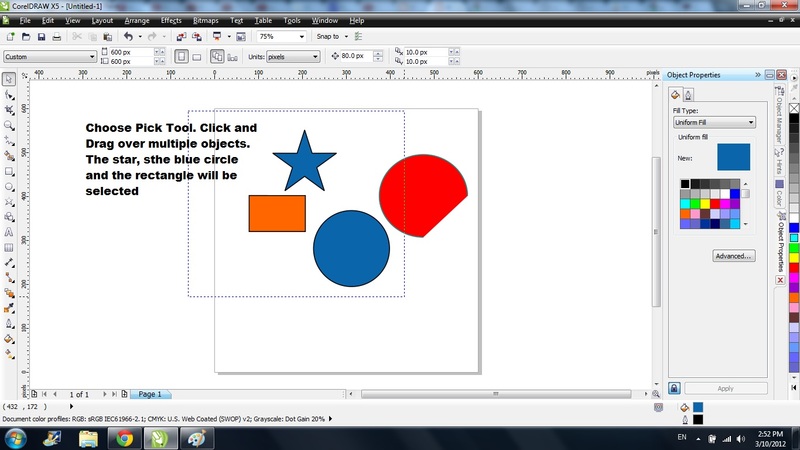 Click and Drag over multiple objects. All objects that fall completely within the marquee area will be selected. Release your mouse button and handles will appear around the perimeter of all objects selected. Check the status bar to confirm the number of selected objects. Choose the Pick Tool. Click on one object to select. Hold down your SHIFT key and click on second object.Repeat as needed. This is a good way to select multiple objects no matter where they are on the page.